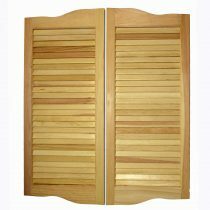 Louvered Cafe Saloon Swinging Doors Available with louvered panels Made from clear unfinished ponderosa pine 1-3/4″ wide stiles Assembled with 1/2″ x 2″ dowels Hardware for hanging is included Sale price is good on in store purchases and local delivery. Online orders offer tier discounts up to 15% off. 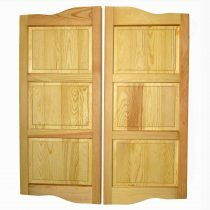 Three Raised Panel Cafe Saloon Swinging Doors Available with 3 raised panels Made from clear unfinished ponderosa pine 1-3/4″ wide stiles Assembled with 1/2″ x 2″ dowels Hardware for hanging is included Sale price is good on in store purchases and local delivery. Online orders offer tier discounts up to 15% off.